In this sixth-grade Edible Schoolyard class, students are welcomed back after the winter break to start the new semester. They discuss seasonality in depth and review how the 4B’s can be applied in the garden (Be Safe, Be Respectful, Be Responsible, and Be an Ally). Welcome students to the Ramada and review the Respect in the Garden poster. There are usually four jobs, or four jobs and one lab, or one to three stations for students to rotate between. Have each teacher explain further about the job they will be leading. Tell students to note one thing that has changed in the garden to share in Closing Circle and to remember their garden name from the fall semester. Divide the class into four groups for garden jobs. 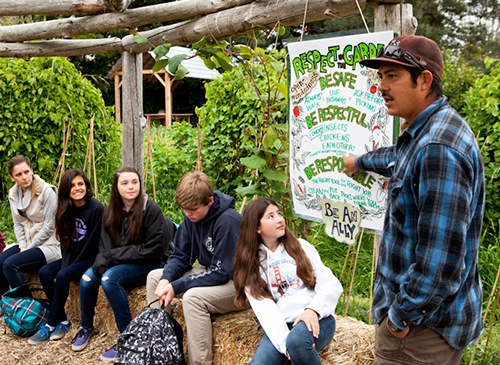 The class is broken into four groups, each with one garden teacher and six to eight students who focus on one job. Check in and review garden job at the job site. Have each student answer a “check-in” question. Ask if they notice anything that has changed in the garden since their last day before winter break. Remind them to remember their answer, or look for one if they didn’t have one yet, to share in Closing Circle. Break down the steps for the garden job and have students identify necessary tools before going to the toolshed. Work together on your garden job. Give students short breaks for chicken time and foraging. Ask students to share their garden name. After students share their garden name, ask them to identify one thing that has changed in the garden since the fall semester.